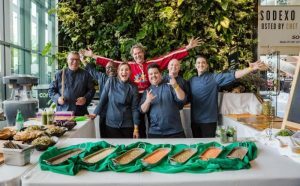 Toronto’s best chefs, beverage sellers joined forces to unite Toronto food lovers in raising $925,000 for Second Harvest during the 27th edition of Toronto Taste. AFGI was proud to take part in the Second Harvest live auction on Sunday, June 4th, 2017 lakeside at Corus Quay. The fundraiser presented and sponsored by The Daniels Corporation, raised $925,000 for Second Harvest. The non-profit serves an important role in our community by serving 1.8 million people facing hunger in the Toronto region. Our team had the privilege of organizing and running the live auction portion of the event. The auction featured some exciting items for bidding such as some exciting chef dinner packages including dinner at Bob Blumer’s LA home and an exclusive opportunity to join renowned chef Roger Mooking on a tour of New Orleans. Dinner packages from Michael Smith, Michael Hunter, Roger Mooking and Bob Blumer raised a total of $46,000 for the charity. Attendees of the fundraiser were treated to a diverse selection of food and drink from over 90 of the region’s best restaurants and beverage vendors including Baro, Lavelle, Kanpai Snack Bar, Bar Reyna and Ufficio, all new this year. The event featured well-known chefs including Guy Rawlings (Montgomery’s), Anne Sorrenti (The Oakwood Hardware Food & Drink and Chopped Canada winner) and Eric Chong (R&D and MasterChef Canada winner) entertained guests in the Chef Challenge. As the event concluded Guy Rawlings was awarded the winner of the Chef Challenge. Toronto Taste successfully raised $925,000 for Second Harvest through generous bidding and donations. Bob Blumer, Second Harvest Ambassador and long-time supporter, reached his goal of personally raising $165,000 that will be used towards purchasing a truck for Second Harvest through an anonymous donor that came forward to top up the fundraiser funds. Purolator Inc. came forward and donated an additional truck to Second Harvest. The company has a long-standing track record of supporting the charity and their work and their generous donation will have a great impact on helping those facing hunger in our city, as the truck will be used to transport food to hundreds of social service agencies across the GTA daily. Funds raised from the Toronto Taste will help Second Harvest provide 1.8 million meals for children, adults and seniors experiencing hunger in the city. The charity was first established in 1985 and has now become the largest food rescue charity in Canada. Second Harvest works to rescue otherwise wasted surplus fresh food and brings it to social service agencies throughout Toronto. It’s estimated that the group has rescued and delivered over 116 million pounds of good food, thus preventing 50 million pounds of greenhouse gases from entering the atmosphere. Second Harvest’s vision: No Waste. No Hunger. At AFGI, we are privileged to bring our years of auction experience to events such as Toronto Taste and help them achieve their fundraising goals. We are proud to have helped such an important cause for our region. Learn more about Second Harvest and their important work at http://www.secondharvest.ca/.